You probably think that taking the photographs for the "Present" part of this blog is pretty easy - just swanning around with a camera, firing off shots here and there. For the most part that's true, I'll admit. But there are problematic parts to this endeavour too. Rain, for one. The rain we get in Brisbane tends to be the tropical downpour rather than the drizzle you might see elsewhere, so it's almost impossible to make a decent image, as well as being dangerous for photographer and camera alike. Then, of course, there is the ubiquitous white vehicle parked in front of the structure to be photographed. A giant white expanse can ruin any picture. But for today's post, I faced a different problem, and here it is. A dog. A very big dog. Who was hiding behind the gate while I approached, and then stood up on his hind legs with front paws on the gate just as I was about to click the shutter. And barked - not just a yap, but a deep, loud, spine-tingling BARK - the sort that makes the hair on your neck stand up. Scared me witless, it did! It's a pity that's as close as I could get to a picture of today's subject, because it is one of Brisbane's loveliest homes. But as well as a patrolling dog, the property is surrounded by mature trees, so taking a photograph of the building is very difficult. You can just make out some of the timber fretwork and a pavilion in the background of the photograph. Patrick Real's story is one of those that show that a poor immigrant with intelligence and a healthy work ethic can make a great deal of himself, despite the challenges that life can bring. Born in Ireland in 1846, he emigrated at age four with the rest of his family, but his father died on board the ship before arrival in Australia. When they arrived here in 1850, Patrick's mother took the family to Ipswich, south-west of Brisbane to live. Patrick finished his schooling at age twelve and was apprenticed to a carpenter, then he worked in the railway workshops at Ipswich. His biography says that he became interested in the law around 1870. Because of the family's financial constraints, Patrick was forced to study whilst working and supporting his mother. Unable to pay a fee to join the Bar, he truncated five years articles into three, and was admitted to the Bar in 1874. Patrick Real was a lifetime teetotaller and non-smoker, about 191 cm (or 6'3" in the old language) tall, combative and intelligent. He quickly became a barrister of note, being one of the highest earners of his time, and in 1890 he was appointed to the bench of the Supreme Court. After the judge's death, Eulalia had a mixed history. It was vacant for many years, even regarded by the locals as a haunted house. Subsequent owners the Hancock family, successful timber merchants, restored the house and then converted the grounds into a museum, the Early Street Historical Village. 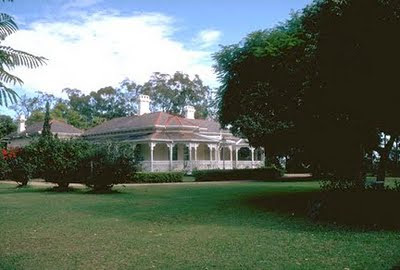 The Hancocks were supporters of the National Trust of Queensland, with Mr Stanley Hancock being president for a time. Regrettably, Early Street closed some years ago - I don't know who owns the property now. 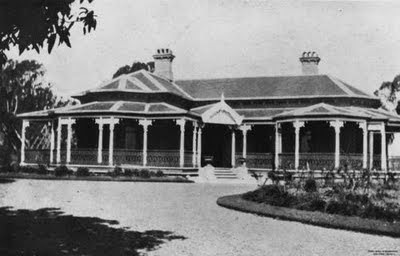 "It has several rare and highly decorative architectural features, including the verandahs surrounding the bay windows and their finely detailed verandah posts and brackets. These features, combined with the fine quality of interior finishes and fittings, including cedar joinery, internal pilasters and columns, and flooring of tessellated tiles give Eulalia considerable aesthetic significance." It's just a pity that the house is now so difficult to see! Great house and even better surrounding property! especially verandas surrounding the bay windows, finely detailed veranda posts and brackets and flooring of tessellated tiles. Can you tell if the posts, brackets etc were originally iron or timber? For an 1889 house, we would not expect timber. "The verandah continues around three sides of the house, featuring a cast iron balustrade separated by tapered octagonal timber posts with decorative capitals and fretwork brackets. The principal timber is beech." What an amazing man Patrick Real was ... self made. I can remember visiting Early Street whilst at primary school. Did other houses make up the museum? I can't remember. I seem to recall that there were other buildings there, MAG, but they were probably outbuildings of the original house. If any descendants of Patrick Real, or of any of the Reals from Ipswich read this, could they contact me? I have a connection through marriage to the Real family. Patrick's brother Michael Real was a one time Mayor of Ipswich.